Prehistoric users of the Valley of Fire included the Fremont people and later the Anasazi farmers from the nearby fertile Moapa Valley. The span of approximate occupation has been dated from 300 BC to 1150 AD. Their visits probably involved hunting, food gathering and religious ceremonies, although scarcity of water would have limited the length of their stay. Fine examples of rock art left by these ancient peoples can be found at several sites within the park. 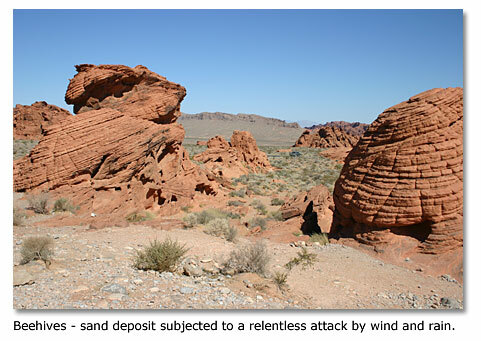 The Valley of Fire is the site of many Indian petroglyphs, including a depiction of the atlatl ("at-lat-l''), a notched stick used to add speed and distance to a thrown spear. The atlatl was a predecessor to the bow and arrow. A half-mile round-trip walk to Mouse's Tank through a sandy canyon, with trail markers to point out interesting features, including fine examples of prehistoric Indian rock writings. 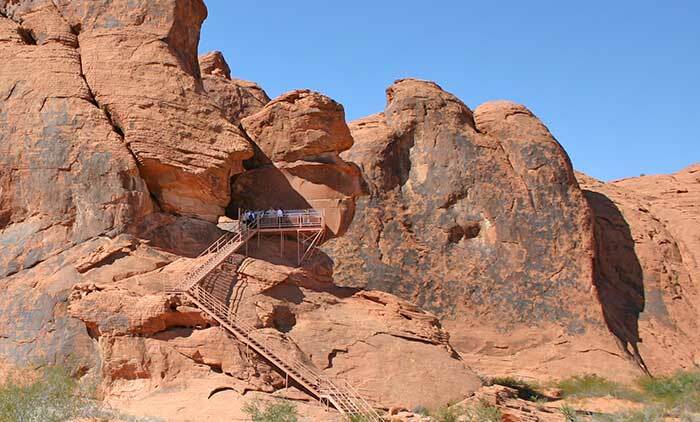 The Valley of Fire plant community is dominated by widely spaced creosote bush, burro bush and brittle bush. Several cactus species, including Beavertail and cholla, are also common. Springtime blooms of Desert Marigold, Indigo Bush and Desert Mallow are often spectacular along park roads. Resident birds include the Raven, House Finch, Sage Sparrow and Roadrunner. Many migrant birds also pass through the park. Most desert animals are nocturnal and not frequently seen by visitors. Many species of lizards and snakes are common, as well as the Coyote, Kit Fox, Spotted Skunk, Black-Tailed Jackrabbit and Antelope Ground Squirrel. The Desert Tortoise is a rare species and is protected by state law. The Valley of Fire derives its name from red sandstone formations created from great shifting sand dunes during the Jurassic Period, 150 million years ago. Complex uplifting and faulting of the region, followed by extensive erosion, have created the present landscape. Other important rock formations include limestones, shales and conglomerates.